Book Dragon's lair: another challenge? 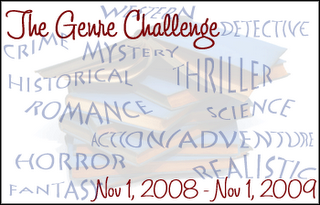 Samantha at Bookworms and tea lovers is hosting a challenge I'm thinking about joining. To read one book in the following genres: crime fiction, detective fiction, mystery fiction, horror fiction, thriller fiction, romance fiction, science fiction, action/adventure fiction, fantasy fiction, realistic fiction, historical fiction, and western fiction. She's given us three levels: read one book from each, delete the one you read the most & the one of your choosing, delete the one you read most. There is a link with specific descriptions. Oh My! I've only got two genres to read! I wonder if I can before the end of November....maybe not, she wants them reviewed! A: Read 10 books, drop the genre you read the most and one of your own choosing. I'd drop Historical because of all the historical romance I read. It's a toss up as to which of the other two I'd drop, depend on what book looks good. I'm not reading Carrie or Cujo nor do I want the book to be from the murder's point of view. ummm, I'm sure there will be something I can read. Is there such a think a "light" horror? Interesting challenge. Next year I will be more selective with my challenges.